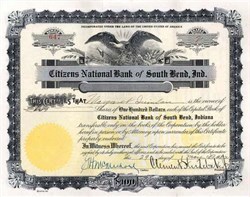 Beautifully engraved certificate from the Citizens National Bank of South Bend, Ind. issued in 1923. This historic document has an ornate border around it with a vignette of an eagle. This item is hand signed by the Company’s President (Clement Studebaker jr) and Cashier and is over 80 years old. This is the first time we have had this certificate. Clement Studebaker, Jr. 1871-1932; He was an officer and major shareholder of Studebaker Manufacturing, served as President and Chairman of the Board of the Illinois Power and Light Company (and of its subsidiary, the Illinois Traction Co.,) the Citizens National Bank of South Bend, the South Bend Watch Co., and the North American Light and Power Co. Vice President of the Everett-Metzger-Flanders Co. (E-M-F). Treasurer of the Chicago and South Bend Railroad.